Ambujanagar: Ambuja Cement Foundation (ACF), the CSR arm of India’s leading cement company Ambuja Cement Ltd., marked its Silver Jubilee year with a grand celebration at its mother plant in Ambujanagar (Kodinar district), from where it embarked on an incredible journey that has empowered and transformed over two millions lives through holistic initiatives, thus spurring a radical change in the landscape of various regions. 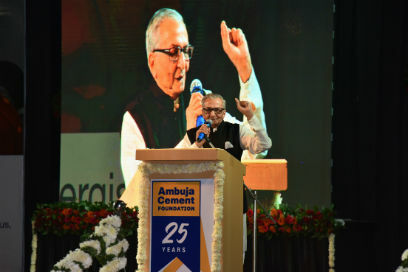 The recently held event was graced by Ambuja Cement’s Founder and Chairman Narotam Sekhsaria whose single-minded visionary approach with a strong sense of social commitment was instrumental in the creation of ACF. All the dignitaries were welcomed to the glittering function by a 28-strong school band that kick-started with an evening of testimonials, inspirational speeches and a fun-filled, energetic cultural program collectively held by Women’s Federation, Skill and Entrepreneurship Development Institute and Ambuja School. The entire evening brought home the point of how working with the community is so fulfilling. “Through Ambuja Cement Foundation, we have done some iconic work in the region that no other cement manufacturer had done before,” continued Mr Sekhsaria. “ACF has grown from strength to strength and become the hallmark of our CSR activities,” he added. In fact, ACF’s work with communities has played a role in the Company earning a 5.5 times Water Positive status, making us the only cement company in India to accomplish this remarkable feat, added Mr Kapur. Lauding the visionary approach of Mr Sekhsaria, ACF head Pearl Tiwari said, “He encouraged us to action out new ideas even when we sometimes failed in achieving our goals. The Ambujanagar plant indeed has been the inspiration for every new CSR project launched. The support from senior management and ACF teams over the years is commendable,” she said. “It is because of these foot soldiers that we have been able to dream bigger than ever before,” Ms Tiwari concluded. Among those who passionately shared their testimonies included Poonam Bhargava, a former student of SEDI and now a nursing assistant; Dr A M Parakhiya, Director – extension education of Junagadh Agricultural Institute; Jayshribhen Bharga who is part of Women’s Federation and Ashokbhai Dahima, a farmer. They expounded how Ambuja Cement Foundation interventions have completely changed their lives, families and communities.